So how many of you with bees hasn't felt like that poor fellow in the picture above? It was a long brutal winter. Reports state losses of 30 to 75%!! Starting a new colony on un drawn foundation. Getting the bees started building up before the natural flow starts. Preparing them for winter when the fall flow has been weak or non existent. Helping them through the last few weeks of a bad winter to keep them from starving. I often see posts, and get questions about when to feed, how often and how much. There is inevitably SOMEONE who posts or says DON'T FEED, or NEVER FEED. With statements like Sugar syrup is NOT good for your bees! Honey actually contains the same basic sugar units as table sugar. The choice is obviously YOURS to make. I prefer to supplement what they can get until they are strong enough to get everything they need. When doing a split, you normally have few foragers. Those you do get will return to their original hive, unless you move the new split two or three miles away. Give them SOMETHING to live on! I will go more into detail at the bottom, under NEVER feed your bees! This frame was put in five days before this picture. No natural pollen or nectar was coming in. I am feeding, and they are taking advantage of what I am offering, and that is the entire point. Get those new frames drawn out early and fast before the natural flow even begins. Good strong colonies ready to split when the new queens arrive. Feeding bees pollen, pollen sub or a pollen patty has been shown to reduce the spore count of Nosema Ceranae. Bees that have a high mite count, but are well fed have been shown to be as healthy as bees with a LOW mite count that were not fed. Pollen or pollen sub is inexpensive insurance for your bees, compared to the price and work of installing a new package. A quick vid of feeding my bees in the spring below. Bees produce wax most prolifically when they are forced to hold nectar, honey, or syrup in their honey stomach. They begin to secret the wax in large amounts, and this is the reason a swarm is such a wax building monster. The bees swarming will load up on honey for their journey. By the time they find a new home, they are pumping out the wax, and can quickly construct new comb. This is by design of evolution, and you can take advantage of it by feeding the bees when they need to produce wax to fill new frames. As in most things Beekeeping, there are many sources of information on the various methods to feed, and the various types of "food" to feed. There are basically two types. Sugars for energy, and proteins for nutrients. Bees DO build up a type of fat reserve called Vitellogenin. Sugars wont help with that, but proteins will. Lets talk about Sugars first; HONEY is 80% sugars and 20% water, give or take a few points depending on how well it was dehydrated. Honey actually contains the same basic sugar units as table sugar. Both contain glucose and fructose. Granulated table sugar, or sucrose, has glucose and fructose hooked together, whereas in honey, fructose and glucose remain in individual units. Fructose is sweeter than glucose, which is one of the reasons fructose is used in so many food products today. However, fructose does not convert to energy as efficiently as glucose. Honey is obviously BEST to feed your bees, but good old granulated sugar can get them by. If you have no honey to give the bees, then the next best thing is sugar syrup. HONEY from other hives, and even store purchased honey can have spores and diseases in it that will be transferred to your bees. These things will not affect US, but they may well cause problems for your bees, so use ONLY honey from your own hives, and preferably from THEIR hive. There is as already stated, a few places with a lot of information on syrup and high fructose corn syrup, and the types of sugars they contain, so I wont go into that any further. Instead, I am going to state what I do, and use. Syrup for spring is mixed 1/1. Sugar for fall is mixed 2/1. Sugar and water weigh the same, and take up the same volume, until mixed. Half a gallon of sugar, and half a gallon of water does NOT make 1 gallon of syrup. The sugar dissolves and is suspended in the water, BUT, the half a gallon of sugar, mixed with half a gallon of water IS 1/1 syrup. You can use a scale if you like, but I use a measuring cup. You do NOT need to measure or weigh to be "exact" in your mixture. Close enough is close enough. 1 cup of sugar, and one cup of water makes 1/1 syrup. Mixing 1/1 you don't need to add heat, it dissolves readily and is immediately ready to feed the bees. 2/1 Syrup is more difficult to dissolve. As the concentration gets higher it takes more to get the sugar dissolved and suspended in the water. 2/1 syrup is obviously thicker, and it is easier for the bees to prepare, dehydrate and cap to use as winter stores, which is why 2/1 is recommended for fall. In spring and summer I use jar lids with 3 tiny holes. THis lets the bees get some syrup, but limits the amount they can get FAST, so they are more likely to USE it to build comb with or to stay alive. In fall I want to feed FAST so they store the syrup for winter, so I use jars with six to eight holes. I hope it is obvious that HONEY is better for the bees? DON'T take ALL of their honey and feed them vast amounts of syrup to replace it. They will be MUCH better off with honey. SYRUP is to get them through because of a difficult situation. For example, NO fall nectar flow, so they did not build up enough stores to get them through the winter. Measure out your water, and heat it until it starts to lightly boil. SHUT OFF THE HEAT, or remove from the heat, and THEN pour in your sugar and begin mixing. Two cups Sugar to One cup water. The sugar will make the water cloudy. Stir until the liquid is once again clear. Let cool to room temps, and it is ready to feed. If you boil while mixing the 2/1 syrup, it will rapidly begin to crystallize when you put it in jars, and you will end up with a slushy mess in the jars. All is not lost if this happens. 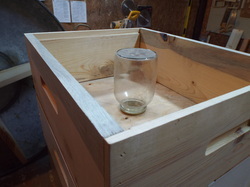 Remove the lid and lay the jar on its side and the bees will clean it out with enough time. But bees cant survive on Calories alone! Could you live on SUGAR with nothing else? I am not a bee, if I was a bee, then yes, I could, at least for a few months.. in fact, if SUGAR was all I had to eat as a human, I would certainly eat it, rather than starving to death.. In winter, when little brood rearing is going on, the Protien, Vitamin, Mineral and Lipid needs are quite low. Usually ther bees can suppuly this small need through pollen they previously stored. The major NEED, is for Calories. Calories are what keep the colony alive, and warm. Sugar WILL provide those calories if honey is not available. Remember what honey is, and remember what sugar is. The difference is in the moisture requirements. Honey has all the moisture the bees need. Dry sugar does not. Thankfully, there is usually enough condensation in a hive to supply that moisture. If you insulate your top board to keep that condensation from dripping on, and killing your bees, GOOD, but there will still be condensation above the cluster, up to the point the bees reach the top.. then there will be condensation around the cluster, and in all cases, the bees will make use of it. As a general rule, I do not feed syrup if it will be 45 Degrees or colder. If the forecast says it is going to 45 and higher I will put syrup on.. There are many methods to feed syrup and pollen, or pollen sub to your bees. You need to pick the method you like best and use it. Warnings include drowning bees if they have nothing to land/stand on to collect syrup, or no way to get OUT if they fall in. Yes bees do quite often "fall". Hive top feeders work, frame feeders work. I don't like to have to open the hives to feed, disturbing the bees at every feeding. So, I feed one of three ways. 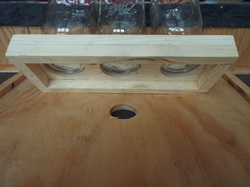 The top three holes are for inverted jars like used in Boardman feeders with small holes in the lids that the bees can draw the syrup through. The tray in the bottom is for pollen and pollen substitute. I use old gallon jars with the small mouths. Pictures of these also at the bottom of the page. OPEN feeders should be used with caution. Neighbors bees, and feral bees WILL find it, and use it! I have two beeks within around seven miles of me, both have only a few hives. I stay in contact with them, and KNOW when they put honey supers on in the spring, and take them OFF in the fall. You don't want to contaminate your or their honey with syrup! Feeding individual hives from the top. Simply making the hole in your inner covers 2 3/4 inches allows you to put the jar in place at the top of the hive. Make sure the notch on your inner cover is UP, place another empty box on, and cover it with the inner cover. Notch goes UP, so other hives don't use the upper entrance to ROB the syrup and honey from this hive. With the notch up, there is no need for the bees of this hive to defend against those robbers. 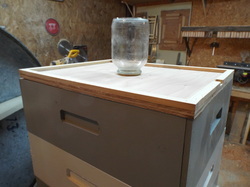 The notch will also add a little ventilation to the top box so the syrup does not get hot and start to leak. If the temps are still a little cool, this will also allow the bees warmth to keep the syrup warm enough they can take it. Insulation can even be put around the jar to help keep it warm in cooler temps. The syrup will need to remain 50 (?) degrees for the bees to take it. If its 30 at night, and 60 during the day, this will keep them going. Insulating the jar will also keep the temp of the jar from rising fast enough that the syrup starts dripping into the hive. If Your temps are 30 at night and 80 in the day, some caution is advised. You DON'T want the syrup dribbling all over your bees! Another word of warning here. Fall feeding needs to be done at such a time, that the bees have time to dehydrate and cap it. Feeding LATE fall means they may not get the job done, and that will mean extra moisture in your hives. So try to give them the time they need! Feeding in the spring is to convince the bees there is a nectar flow, and get them building comb and making brood before the flow starts, for a faster build up and stronger hive when the flow is on, or to produce splits. Spring feeding should be done slowly. You do not want the bees to store the syrup you feed them in the spring, you want them to use it. If you use a top feeder, baggies or many other types of feeders, you cannot regulate how much they get. They take all they want and usually stuff a lot of it into the cells to dehydrate and cap. You need a method of regulating it. 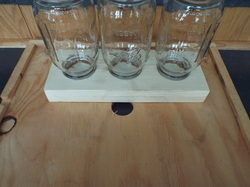 I use jars above the inner cover hole, and put three holes in that jar lid. Three tiny holes.... The bees get some syrup, but they cant get it as fast as if they have 20 holes or more like a commercial lid from one of the suppliers. One jar will last three or four days, as opposed to them having it empty overnight. Fall feeding is not for brood production, but to GIVE them the resources to get through the winter. If you give them fumagillin this is also the time to get that on. Their jars have 10 or more holes, and they will take a single quart of syrup down in a very shor time. They put this syrup in the cells, fan it to dehydrate it, and cap the cell. To them, this is honey! If you taste it, it may be indestinguishable to you as well. Most beeks abhor these things, and they have good reasons to do so! I am going to talk a bit about how to fix at least a couple of the problems if you WANT to use an entrance/Boardman feeder. The normal Boardman most hive kits come with to the right. MY style entrance feeder to the left. The standard Boardman feeder is narrow, with JUST enough room for a bee to get into and out of. WHEN, (not if) the sun warms it up, the syrup will dribble out, and drown your bees, they will PACK the feeder full with dead bees, and this will cause the feeder to continuously dribble, all the while the syrup is running out into the hive because this feeder sits on TOP of the bottom board. IF you have the entrance reduced to help prohibit robbing, as you should! The syrup will have to build up along the reducer until it can find a way OUT of the front of the hive, (You do have your hive tilted slightly toward the front right?) and this will draw a VAST robbing frenzy and create a sticky nasty mess. So, how do you avoid that situation? This is my revamp on the venerable entrance feeder, and the method I recommend using if you desire or need to do so. First, the entrance needs to be reduced to a couple of inches, and something should be put across the entrance so robbers cant zoom straight in. I have a piece of plywood leaned up over the entrance. A board or a piece of screen wire will work, anything to stop the direct flight path into the hive. I have fed this way even in a dearth without robbing problems. BUT, your situation needs to be carefully monitored. A little care and common sense is required, as well as paying attention to insure robbing does NOT start! My feeder is not ABOVE the bottom board. The bottom of the feeder is EVEN with the bottom board. If/WHEN the syrup leaks, it will not flow into the hive, it will drip out of the small holes I have drilled in the bottom. I have some with one hole, and some with two holes that are about 1/4 inch drill bit size. Other bees WILL find this, and take advantage of it, but they will NOT be drawn to the entrance! The opening is the same as the entrance to the hive, 3/4 of an inch. This allows the bees the ability to get in, and OUT, even if they get sticky. They are not trapped, and drowned inside of the feeder. 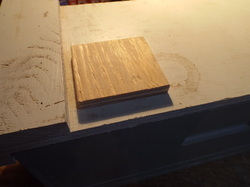 A 3/4 by 3/4 reducer placed against the feeder so the entrance is on the opposite side of the hive, and only a couple inches left for entrance or exit. Then, something used to block direct flight INTO the hive. The smaller opening is easier to defend, and the blocked flight path keeps would be robbers from zipping past the guard bees. Open feeding will usually reduce the amount of robbing. In more than one case It has STOPPED robbing completely within an hour. Just make sure you ( Or your neighbors ) don't have honey supers on or the honey will get contaminated by syrup. 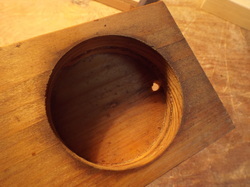 As mentioned, a small hole (or two) drilled in the bottom of the feeder near the edge furthest away from the hive will allow any leaking syrup to drip from there, reducing problems even more. The drilled hole trick will also help with the commercial entrance feeders, just make sure that hole is too small for a bee to get through. When the feeder leaks, other bees will be drawn to this spot, (and the ground under it) rather than to the entrance of the hive. This feeder will not work AS IS with a hive stand/landing board. 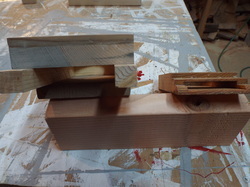 You will need to cut the bottom lip of this feeder to a 45 degree angle, OR make a cut out in the landing board/stand for the feeder. This is a standard Boardman as most supply places sell, or send with beginners kits. You can see the modification hole drilled in the bottom to allow the syrup to drip out rather than running down into your hive, killing bees, and or causing a robbing frenzy. 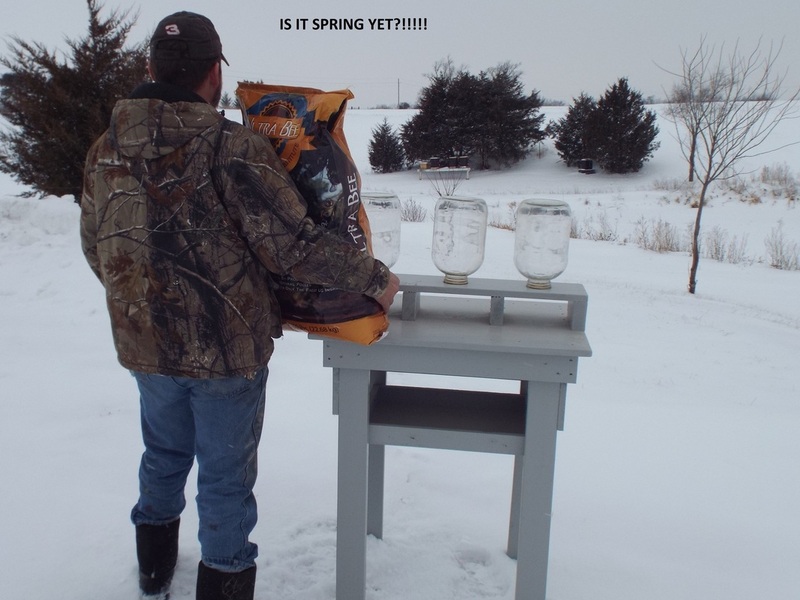 I have seen feeders made of plastic pop bottles that fit into holes drilled in the top of Nuc's. It works, but I really don't like filling pop bottles with syrup. The pop bottles don't hold much syrup either, which means refilling them more often. Drilling a larger hole allows you to use a quart jar, but then you have a big hole in the top of your Nuc!! So keep the plug from the hole you cut. Glue, or nail it to a larger piece so you can drop it back into the hole if your done feeding this Nuc. The bees will propolis this in place quickly, and it wont go anywhere until you pry it back out. Another option, IF you have a hole in the top of your nuc's, is feeding with the jar stands as posted below. You can still cover these jars with another nuc box, even if there is a gap, the idea is to protect them from the sun, not seal them up. The advantage of this feeder style is that you can put them over any hole. I don't make many of the two or three jar stands, because it is easy to put a lid in the holes I do not wish to use on the 4 jar. 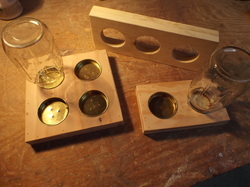 So the 4 jar stand can be used with, from one to four jars depending on the needs of the hive or Nuc they are sitting on. If the hole in your inner cover is too small for a jar, or Oval shaped as most commercial inner covers are, you can use these stands with no modifications. The oval hole is designed to fit a Porter bee escape. The shape serves no other function, but does work well to allow the bees up into the feeder. These feeders restrict the bees to the feeder, they have no access into the box where they may begin building comb. I prefer to put 3 small holes in the jar lids I use over a hive so they have a tendency to leak less. The bees are also more likely to USE the syrup than store it. I use a box around them to keep the sun from warming them up and causing them to leak. 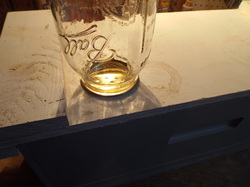 As long as I keep the jars out of the sun with a box around them and a lid on top, the bees seem to keep the jars warmed up nicely so they seldom leak when the temps go from a night time temp of 70 to daytime temps of 90. As already stated, if your temps vary a lot, IE; desert conditions of freezing at night and 105 in the daytime, you will need to check these often until you are confident they wont cause problems. I make these with two holes, for two jars, three holes, and four holes. Four jars puts 1 gallon of syrup over your inner cover and lessens the amount of times you will need to check and fill them. The ones I make can be purchased through my wife's website as well. I will add each different style as I get pictures of them to put up. The design is for QUART mason jars. You can buy small mouth half gallon jars, but they will NOT fit under a telescoping cover on a medium box. I have read a lot about pollen subs. I see formulas for mixing your own, and even making patties with it for the top of the hives. It is my opinion that it's a lot of work for not a lot of savings. You can buy GOOD pollen sub, and GOOD pollen patties already made up for about the same money if you consider your time worth something. Yes! If you wish to figure protein content of brewers yeast and soy flour etc etc, and make your own, then by golly that's what you should do! For no more than I use, its just as easy to buy the patties and the dry mix. Patties can be placed on the top bars well before warm weather to help the bees start building brood. I have found, that if I have DRY mix available when they start flying, before natural pollen is readily available, they still build up in plenty of time for me to do splits in early May. BeePro, MegaBee, UltraBee and several other supplements are available that have been WELL tested, and shown to be beneficial. I am not arguing whats BEST for the bees here. Honey and natural pollen IS best for the bees, but syrup will keep them alive until they can get their own nectar, and pollen substitute will let them start raising brood before they can get natural pollen. I have tried, and LIKE Ultra Bee from Mann Lake. I pour this straight from the bag into the tray under my feeders, as in the main picture at the top. IF, I have natural pollen I will mix that in as well. I have used 5 gallon buckets with half the lid cut away, laying on their sides. I have helped build feeders from 4" cpvc sewer pipe, and I have seen people mix flour and sugar into their pollen subs and set it out in cookie baking pans. If, and HOW you wish to feed is entirely up to you! Normally the bees find it on their own, but if yours don't seem to find it quickly, a few drops of honey on the edge of the feeder will draw them like flies to poo! Watching the bees DIVE BOMB into this stuff is a blast! There are MANY MANY ways to feed, and the methods I have shown here don't even scratch the surface. My methods are designed to limit the amount of work I need to do. Limit the amount of times I need to disturb the bees, and still provide them with what they need, when they need it. I have not touched on the mountain camp method of feeding here, but it is somewhat described in my wintering page. There is another option I have used, and WILL use again, and that is the baggie feeder. Simply putting syrup into a baggie, laying it on the top bars, and poking holes in the top, or making a couple of small slits. it WORKS, but it requires you to pull the inner cover and use a shim. the advantage is that its quick, easy, cheap, and doesn't require any modification of your equipment, with perhaps the exception being the shim to place under the inner cover to make room for the baggie. When I fed my first hives, I was told that I needed to FEED those bees until they stopped taking syrup. The instruction I received said that once a good flow starts, they will no longer care about the syrup, and they will stop taking it. I can say, in my situation, with NO shadow of doubt, that this is ABSOLUTELY FALSE! I found out the hard way, that they NEVER stopped taking the syrup.. NEVER!! They had partially constructed cells filled with syrup. The brood chamber filled with syrup, and even burr comb filled with syrup. They were dwindling rapidly. If I had not realized what was happening and stopped feeding I would have lost those first hives. Packages and new nuc's are desperate for nectar and pollen. They will keep taking and storing until they have everything plugged solid. 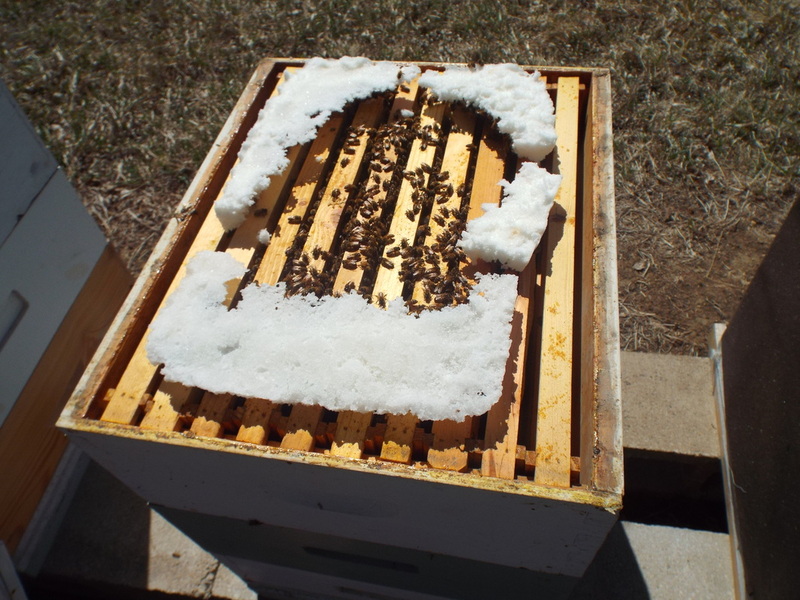 Established hives are not as bad, and sometimes they WILL begin to ignore the syrup in favor of the current flow. So you need to pay attention when you feed! You need to make sure they are well fed, but not OVER fed. In a video I watched by Michael Palmer, he stated that bees are like a room full of teenage boys with a buffet. They will eat EVERYTHING, no matter how much food you put out. So apparently I am not alone in realizing this. Be aware, and don't let your bees become syrup, or honey bound. Add more supers if they are starting to store honey in the brood chamber, and or stop feeding if they are storing syrup there! The same lid fits ALL of the jars in the picture. 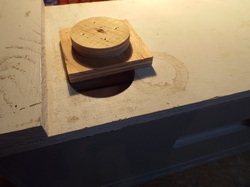 They require a 2 3/4 inch hole saw and depending on the lid a little sanding to fit perfectly. The largest is a one gallon Jar. Unfortunately, they are VERY hard to find. You cannot order them any more. The best you can do is the one beside it which is 1/2 gallon. If you find GALLON size that is SMALL mouth hang onto them! Or better yet, send them to me well packed so they don't break!!! A couple of bee supply houses sell 1 gallon Plastic jugs that take the small mouth lid, but they are BLACK. I found very quickly that they absorb heat and leak like MAD.. to make it worse, the sun makes them soft, the sides give slightly and they leak even worse! 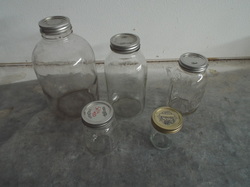 I have put my mother to work looking for the 1 gallon glass jars at auctions, yard sales and antique shops. I have found some in old root cellars, Old barns and old houses. They make feeding easier if using an external, like the one in the main picture at the top. Because of the difficulty in finding them, many are now using the pails in one gallon and three gallon sizes. The jar in the forefront to the left is a pickle jar you can buy in most stores, it has a large opening. Still works good if you want to set it on a couple of spacers. the other jar is a standard wide mouth mason Jar. 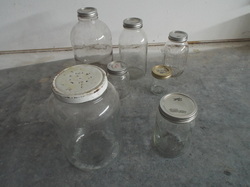 I have found Ball and a couple other places offer gallon size jars with wide mouths. I may have to buy a new hole saw to fit these jars and order a couple cases of the gallon size. Eventually I will probably have to go this route unless I can find a gold mine of gallon small mouth glass jars in someones cellar! I have seen this, and heard this SO MANY times that I am beginning to REALLY want to slap some sense into people. In giving talks and classes, I have run into dozens of folks who followed this advice when starting their new packages, nuc's, or splits. Two or three weeks later they have dead bees. "They never even tried to build comb!" "They were gone when I checked a week later." "The queen was dead in her cage, but the candy plug was eaten." So I always ask, did you feed them? "No, I was told never to feed them. It is not natural, and its bad for them." NATURAL beekeeping is having a colony in a tree in your backyard that you can watch.. IF, on the other hand, you want to have some honey, some wax, perhaps a few more hives in the future, then you are going to have to go UN natural. I will never argue that there are different methods, and that some of those methods are better than others. More natural is not the same as ALL natural. FEED when you start a hive. Be it a package, a Nuc, A swarm, or a split. GIVE them something to get started with. I am a firm believer that sugar, and syrup are not the best thing for the bees, but I am also a firm believer that sugar and syrup are WAY better than starving. If ALL you had to eat was bread and butter, it would keep you alive, but after a bit of time you would not be very healthy. The entire point, is NOT to feed the bees 365 days a year on syrup alone. The point, is to HELP them get started. To keep them from starving until they can get what they eat "naturally" If you were about to die of starvation, would you eat the bread and butter to get through the hard times? Or say no, I prefer to die because bread and butter is not good for me? It seems to me, that dying is not exactly good for you? In some locations of the country, there may be a flow of some type every day of the year. In which case, newly started bees may be able to find SOMETHING, and feeding is less critical. When you start a package, there are no foragers, or few.. Even if there are foragers, it will take them a day or two to figure out the new location and begin bringing in the natural forage. A new colony is usually pretty weak and disorganized. Their population will dwindle over the course of the next 21 days to a month until new bees begin to emerge. If you bought a mated queen, AND installed her with SOME drawn foundation for her to lay in, you have 21 days to wait while new bees emerge, providing she began laying on day 1.. she will usually NOT begin on day one. It has been my experience that she will take two or three days to begin laying AFTER the three or four day wait to get out of her cage. So now you have an added six or seven days. If you have a virgin queen, or a queen cell, or let them raise their own queen, you can add another MONTH to that time in a worst case scenario. You are asking that declining population to forage for themselves and to build comb with aging bees. The harder they have to work, the faster they will decline. FEED THEM! Honey, is always best. Honey from YOUR hives, not someone elses. If you do not have that resource, then 1/1 syrup on a newly started hive will give them what they need to get a GOOD start. They will be less inclined to abscond. They will not be forced to work as hard with so few bees. They can immediately begin building comb. They can feed the brood you gave them, or that queen in the cage, NOW. If you wish to build your hives with a specific thickness of wood so that the wood can resonate with the correct harmonics to help the bees. I am OK with that. If you wish to place your hives over locations with the right frequencies and underground water ways. I am OK with that as well. If you want to plant mint, and Lavender, and bring in mason bees and bumble bees to make the environment more harmonious and natural to your bees, I am OK with that too. When someone tells you DON'T feed the bees, reach out gently, and SLAP them hard enough the snot flies! No, don't do that, but it is SO tempting after dealing with so many folks who lost their first bees. Give your bees, and yourself a chance. Losing your first bees so swiftly is VERY discouraging, and for many, it is the final straw, and they never try again. Nosema Apis and Nosema Ceranae are both illnesses that need to be treated with Fumadil or Fumagillin mixed with syrup. If you refuse to feed syrup, how will you administer the medication? If you choose NOT to medicate, even when you are certain your bees have Nosema, then they will be badly weakened, and they will possibly die. I HAVE lost hives to Nosema, thinking that if they were well fed they would pull through. They didn't. It was irresponsible of me to allow that to happen when I had the ability to save them. "If they are susceptible to disease they NEED to die so that only the strong survive!" You are entitled to that opinion, but I will say that you and I will not get on well if stuffed in the same room together. I should have treated the bees " I " allowed to die, saved them, and given them a new queen whos progeny were more resistant. THis is what I do now, and will always do. SAVE my bees, and give them resistant queens in hopes of strengthening them. I don't have to buy more packages, or nuc's or do more splits. In a few weeks the entire hive will be FROM the new queen. The old genetics will be gone. There is NO excuse, NONE for not feeding or treating when absolutely necessary. The difference between a LIVE hive, and a dead one is often determined by the beekeeper. The bees can be as ready as they can get, with plenty of reserves! But if its SO COLD that they cannot move to those reserves, they will perish. All as nature intended? Not a chance, because even the best bees can be overcome. When the bees chimney, or move straight up through their reserves, they are doing their best, and are capable of surviving when its COLD, so long as they have reserves above them... in a natural cavity, they often WILL have enough reserves above them. In a hive, those reserves in the corners and far sides may not be accessible. Feed them sugar, and they will still be alive long enough that they can get to those reserves. The difference to me for the 2013/2014 winter was sugar and sugar cakes. I did NOT have to replace a thousand dollars worth of bees because I prepared them WELL for winter. Beekeepers who have fed fumagillin to field colonies years ago had noted significant differences in colony build up. In fact, many of them stopped using fumagillin. The colonies built up too quickly and swarm control became nearly impossible. Lack of data makes it difficult to establish when sugar became the principal sweetener in any given part of the world, but in every case this has occurred fairly recently. Illustrative are Europe and North America where it was only after 1700 that sugar was transformed from a luxury product into one of everyday use by even the poor. Candy or bakers fondant was first used to feed bees in the 18thcentury because it was the purest form of sugar then available. Over 200 years of feeding bees! Feed them when they need it! I hope that this has given you some ideas that you can use, or modify to use with your own methods and climate.